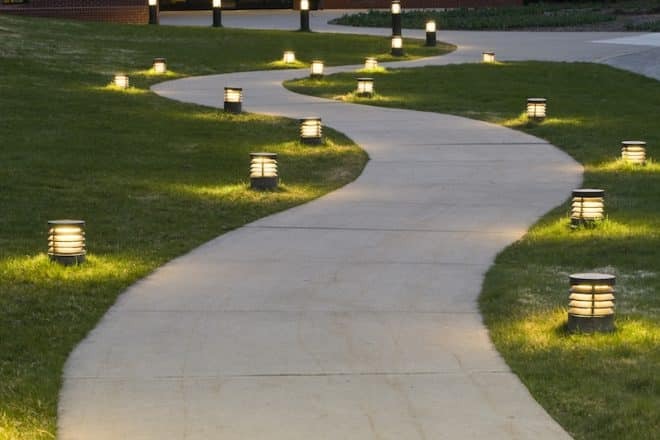 If you’re looking to enhance the access and ease of moving around outside your house, a concrete path is a perfect solution. It’s convenient, cost effective and best of all, it’s a great DIY project you can do yourself at home. Whether your need to get to the clothesline, grab some veggies from the garden for dinner or simply make it to the front door to your driveway, a path will provide a flat and convenient surface to make your life easy. They mean you don’t need to worry about stepping in mud or collecting grass on your feet and dragging it into the house. Concrete paths are also very easy to maintain. When they do begin looking a little worse for wear, you just need to grab a hose and wash the dirt, grass, and debris away in an instant. They can be installed all around your house, garage, carport, pool area or spa, and can link together living areas like BBQ spaces, outdoor entertainment areas or feature gardens. How do you get started? We’ve put together a simple guide you can follow to create your own concrete pathway with a perfect finish at home. So block out a weekend, put your DIY hat on and use the steps below to get the job done right! Here’s a list of the tools and equipment you’ll need for your concrete path. Gloves, long pants (old ones), a long sleeve shirt and gumboots. Concrete can burn any exposed skin, so these are all a must. To measure how much concrete you need, work out the area of the pathway multiplied by the thickness desired. You will need a dry concrete mix, which can be purchased at most larger hardware stores. Follow the instructions. You will also need a wheelbarrow or concrete mixer to put it all together and prepare it for laying. For larger jobs, we recommend ordering concrete premixed. Plot out the pathway you want to create using stakes, and mark the lines with paint. Excavate out the path to a depth of around 20cm. Remove grass, dirt and other debris. Smooth out the soil to create a flat base. Next, pour out the gravel to a depth of 10cm and smooth it out for a flat surface. You can rent a large plate compactor to do this for you. Use plywood planks to create forms for the sides of your new concrete pathway. Start by placing wooden stakes at 10cm intervals, just outside the path itself. Link them up with the planks on their sides, and use screws to secure on the stakes. This will create a guide for the concrete to set in. The stakes need to be lower than the form sides, so they don’t mess up the smoothing later. When you’ve got the forms all built, spray them lightly with water before you get the concrete going. Follow the instructions on the concrete mix to prepare it for pouring. Next, starting at the lowest vertical point of the pathway, begin pouring the concrete into the pathway. When you’re done pouring, use a flat object like the back of a rake to flatten it roughly as you go. Just after the pathway is completely poured, go back over the whole area and smooth it out with a board of plywood across the top of the formwork. This is called ‘screeding’. You can then use a tool called a concrete float to smooth it out further. Allow the concrete to set for an hour or so. Then, use an edging trowel along the inside of the formwork to create expansion joints. These are crucial for allowing the concrete to expand and contract as it sets, which will protect your new path from hairline cracks. If you want to add a non-slip element to your path, try grabbing an old broom and dragging it very lightly across the path. Finally, cover the entire pathway with a plastic sheeting for around 48 hours. This will help avoid further cracking. After this time, you can remove the plastic and plywood forms, and start enjoying your new concrete path. There you have it! Follow these steps to pour your own concrete path around your house. It’s a DIY project that requires a few extra steps, but as we all know, the more effort it takes, the more satisfying the results. Once your concrete path is done you can enjoy it for years to come. Just make sure you keep the dog off it until it’s dry! If all that sounds like far too much effort, be sure to contact the experts at Everlast Services.